I commit to a turnaround of no more than 1 week's time (barring unforeseen circumstances). Please let me know if there is a great need for your capsules to arrive sooner, and I will do my very best to expedite the process. When completed, I will hand-deliver your placenta "goody bag" to your residence. If you or your baby has a new-onset, active infection at the time of delivery or immediately postpartum, please note this is a contraindication for encapsulation and your deposit will be refunded. If you had GBS treated by antibiotics at birth, or another infection in late pregnancy that has since resolved, these are NOT contraindications for encapsulation. 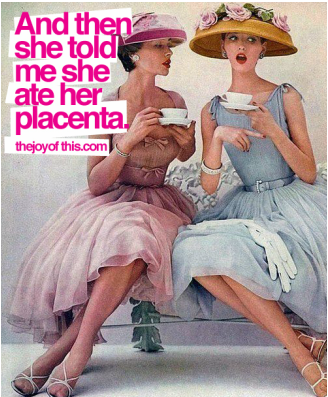 Unless mishandled by your birth attendants, your fresh placenta will only carry bacteria that your body already has. This is known as your body's "normal flora." Be assured I dehydrate at the proper temperature, for the proper length of time to reduce microorganism counts below safe food handling standards. There is no 100% guarantee that *any* placenta process or approach will completely eliminate everything, I only work with clients who are free from communicable diseases and I stringently follow universal precautions for safety and cleanliness. Umbilical cord keepsake: No extra fee. A non-refundable deposit of $75 is required to book placenta services, with the balance due upon receipt of your capsules. Your deposit reserves your spot in my calendar and allows me to plan for all necessary supplies. In the event that you choose to terminate this contract before releasing your placenta to me, any fees paid less the deposit will be returned to you. If you choose to terminate this contract after releasing your placenta to me, the full cost is due and no fees will be refunded. Placenta preparation is not clinical, pharmaceutical, or intended to diagnose or treat any condition. Placenta encapsulation is not a replacement for medical advice, care, or prescribed medications. Fees are solely for the preparation of your placenta and not for the sale of any products. In choosing to utilize these placenta preparation services, you take full responsibility for your own health. Abundant B'earth LLC does not make any health claims nor guarantee as to efficacy, but does guarantee the highest quality of service. I am entering a contract with Abundant B'earth for the services of placenta encapsulation. I understand a nonrefundable $75 deposit is due now, with the remainder to be paid upon receipt of services. I certify that I am currently free from all infectious diseases including sexually transmitted diseases, Hepatitis, and HIV. I understand it is my responsibility to notify Adrienne if I or my baby develop a new-onset, active infection during or immediately following birth. I agree to the terms of the contract. I certify that I am free from disease. I wish to add a Tincture for $25. I want an Umbilical Cord keepsake.